I took it easy last week, figuring it was better to focus on other tasks during the traditional mid-month lull. I still made it out for some runs, and while I came up empty on a few occasions I managed to make some good finds. 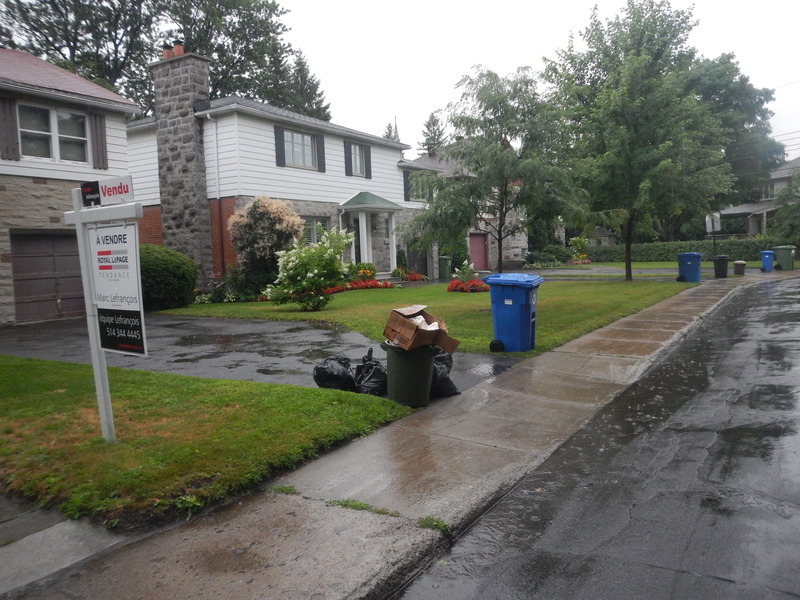 I’ve been checking out the trash in front of this house in Mount Royal for a month or so now. It’s where I found the WWII RCAF cap and the old Canadian flags. I’d guess that they’re clearing out the basement after a move – the rest of the house has always looked very empty. Over the last two weeks I’ve saved more decent stuff, including a collection of late 1930s to early 1940s “College Humor” magazines, a passport to Expo 67, and several nice pairs of glasses and sunglasses. The passport was full of pavilion stickers, many more than ones I’ve seen in the past. I was surprised to see that so many African countries were represented at the fair. I’m thinking I’ll throw the vintage frames into a eBay lot with some others I already have. I might sell the Polaroid Cool Ray “Party Time” glasses (bottom left) individually as I found a pair that sold for 60$. I also like the white, lustrous sunglasses at bottom left, though the only information printed on them is that they were made in France. 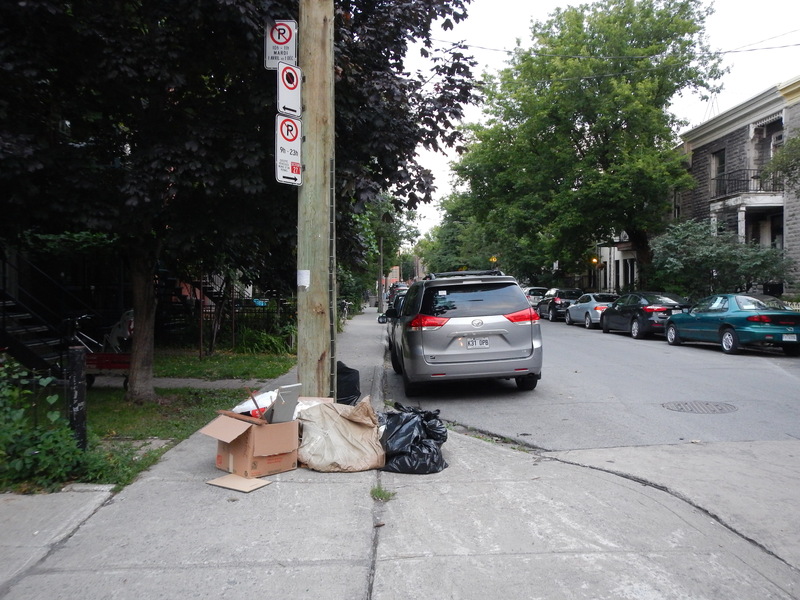 I came across this pile during a little run in the Mile End yesterday evening. Inside one of the bags was a little change-purse with a 10$ bill tucked inside. I guess whoever was sorting through this stuff wasn’t paying much attention! The only other time I’ve found a Canadian bill in the trash was when I found 28$ dollars in old bills back in the winter of 2013. I saved a few other items including: a Kosta Boda candle holder/paperweight, a metal mask decoration from the Hotel Marquis Reforma in Mexico, and a cool Clinton Gore election pin from 92 or 96 that I immediately pinned to my shirt. One bag was completely full of passes for a journalist. Elsewhere I found: a set of cutlery in Laval, two bags of nice wood pieces in TMR (which I’ve put on CL free), a box of vintage “Made in Canada” mason jars in Rosemont, and two film cameras in TMR. One of my favourite finds however was an unopened “special gift” from Mercedes: a solid metal 8gb flash drive featuring a leather cover emblazoned with the Mercedes logo. 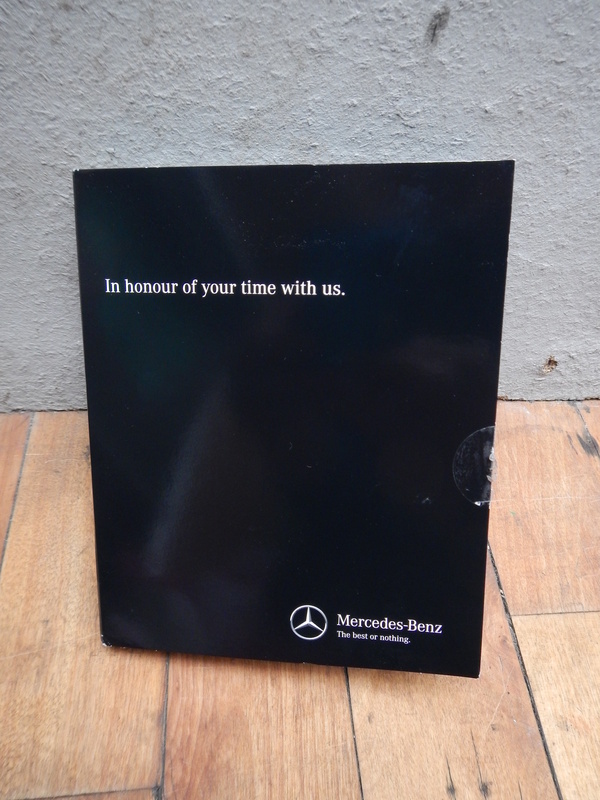 It was given “in honour of your time with us.” It’s not worth much – the 8gb size is sort of outdated with 32gb and 64gb drives now the norm – but I find it funny how this special gift from Mercedes, still brand-new in the box ended up in my hands! In other news, the ring sizer I bought off eBay arrived today. It’s a great tool that easily and accurately determines the size of the rings I find. 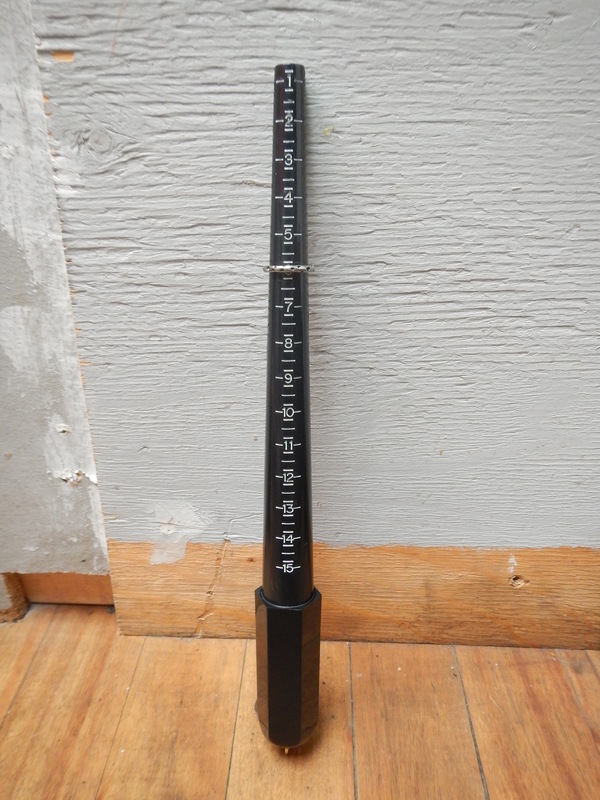 At around 5$ it’s a good investment that will make listing on my eBay and Etsy stores much easier. -Loose change: 30$. I opened a TD bank account because they offer a free change counter and brought in the small change I’ve collected in the last year or so. Most was smaller change because I pick out the bigger stuff like loonies, toonies, and sometimes quarters for spending in day-to-day life. I don’t plan on touching this bank account, outside of once in a while using it to treat myself to something fancy. Much of it came from the jar full of change I found on a cold but pleasant evening in January. -Skygolf GPS Receiver: on eBay for 35$. I found this in TMR a few weeks ago. Total: 65$, 2370$ since May 18. Not a great total. I need to have another yard sale sometime soon. I have some interest in the pieces of wood. Excuse my ignorance – what is CL? Do you know what kind of wood they are? Any idea what they may be from? Thank you for the info….I’ll watch this space. They could be good for wood turning small pieces like earrings and beads. No big items, but interesting stuff nonetheless … and some ephemera to boot. I know how much you like that stuff. I’m going to check out your ebay page, to see all your latest postings. attendance from countries, which is why we remember it as an industry driven fair. Expo ’67 had the blessings of the organizing body, so perhaps that caused more countries to participate. A chance to show off in North America when they might not set up in the US. one for each of the countries. So perhaps some of the smaller African countries shared. So certainly at age 7, there seemed to be a lot of “exotic” countries there, but I’m not sure if that reflects my age, or reality. That’s at least the second Expo ’67 passport you’ve mentioned finding. I can’t remember if you’ve found the Guidebook, but that would give a good picture of the Fair. Twice in the first week of August, I found five dollar bills on the ground as I was walking along. I haven’t found any paper money on the sidewalk in a long time. The first time, I couldn’t believe it, I almost didn’t pick it up. The second time, I grabbed it right away.